We Need More Current to Run Raspberry Pi, Monitors, Sensors. Here is Guide to Setup Extra Battery, Inverter For Car For DIY Electronics Car Automation. I tested Raspberry Pi setup like described in previously published guide on car automation with Raspberry Pi. Do not miss our articles on DIN slot and OBD II. After testing for around 6 months, I understood that one battery of our ordinary cars is not enough to add more sensors. Furthermore, some of the systems need 24×7 power which should be separate from car’s original battery intended mainly for cranking the engine. Our old car has almost everything in two copies – 2 x 2 blow horns, 2 x 2 headlights. Those needs work by car electrician to setup. The way I will tell you to setup battery and inverter, you will tell that to electrician – do not try it yourself as n00b. Car electrical circuit is quite different than our normal electrical & electronics setups. You’ll use normal car battery, first find a place for it outside the interior of car. After installing and securing it, ask car electrician to setup all the electronic accessories stuffs of car (like car stereo, USB/Cig lighter) to be powered from it except the electrical & electronics car needs battery to normally function (like starting coil, lights, power windows etc). Obviously for that setup the battery will need to get charged when the car is running. Frankly, leave that part to car electrician. They know as few those who travel long distances with car have this setup. This setup is no way cheap. Of course, you can add solar panel on car’s roof. There are inverters available for cars – they convert 12V DC voltage of car battery to 220v AC supply like home. When you have 220v AC supply like home, you can buy cheap Made in China things for home automation, like there is Wifi Home Automation Remote Control Switch Socket with iPhone, Android application. This short article is intended to provide the information to have a sustainable power supply to your future project. Now, you need to perform research on inverters available for cars, Wifi Home Automation Remote Control Switch Socket. Obviously, you need a dedicated power supply board inside car like home! If possible, solder metal electrical boxes on the interior of body in some practical place and have the outlet sockets – both 220v AC and 12v DC with electrical switch. The place where it is practical is on car’s B pillar on both sides – plan AC on one side and DC on the other side (otherwise chance of wrongly connecting DC electronic stuffs with AC is higher). Lot of works to do. There are pre-wired car boat switch power panels available in the market. This Article Has Been Shared 5644 Times! TM1638 is a credit card size multipurpose board with push buttons, LEDs, 7 segment display. Here is Basics of Arduino TM1638 Display Module. 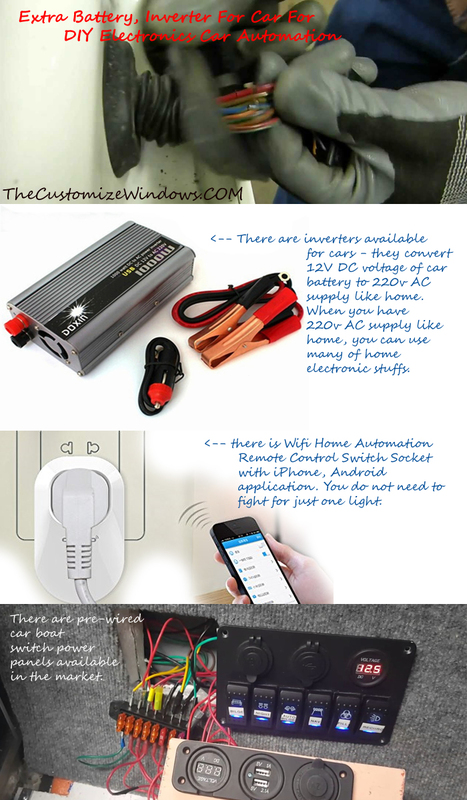 Cite this article as: Abhishek Ghosh, "Extra Battery, Inverter For Car For DIY Electronics Car Automation," in The Customize Windows, April 18, 2018, April 23, 2019, https://thecustomizewindows.com/2018/04/extra-battery-inverter-for-car-for-diy-electronics-car-automation/.